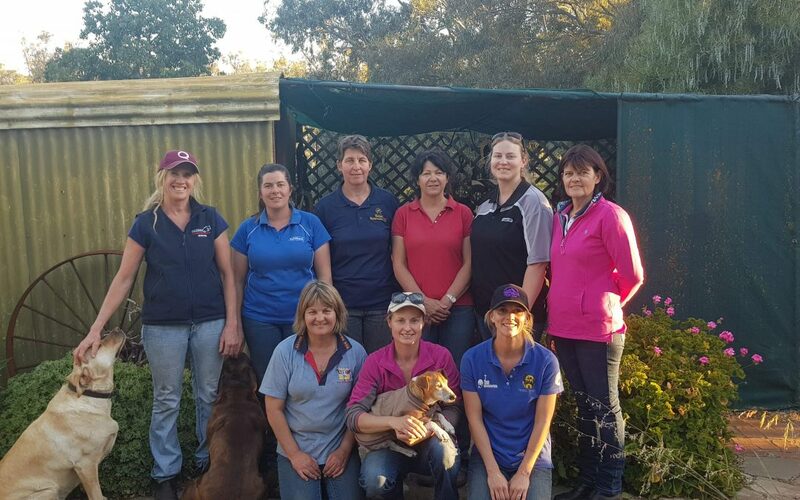 The workshops filled up to full capacity with 8 ladies in total in the group. Sam and Robyn had already completed level 1 with April in 2014. These two ladies attended the level 1 to refresh their memories. Two ladies could not complete all three levels which worked out kindly for me as the total class size across all three levels is 6 each. Needless to say with such a great group of ladies the series of workshops were a huge success. The camaraderie, spirit and positive attitude within the group ensured its success. Deb working on Sunny completing the level 1 workshop. I achieved more than I thought I could. I was very pleased Sunny was happy relaxed pony to give back to his owner, who picked me for him and trusted in me. I found the class delivery as: friendly, encouraging, patient and approachable, with the information presented at the correct level. 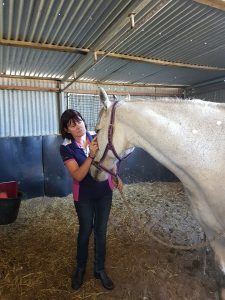 The work conducted on my horses was done with overwhelming care and consideration more than I could have imagined. 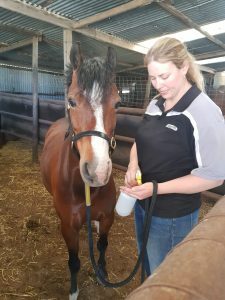 I would happily recommend the workshop to any horse owner wanting to learn to do the work for them selves. Mikaela completing the level 1 workshop. 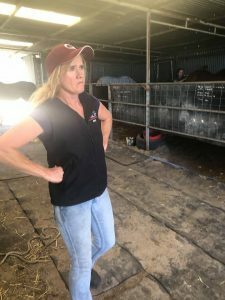 Marisa was very approachable and I felt very comfortable to ask questions and help when working on my horses. Demonstrations were thorough and delivered in a way everyone could understand. I could see instant positive results after each session. 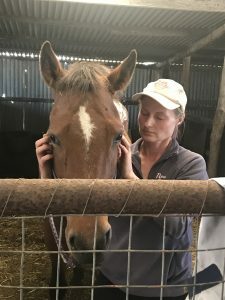 I felt comfortable with other students working on my horses too, due to the high standard of treatment being conducted. I also found starting with theory each day very beneficial it gave everyone a chance to go over what was learnt the previous day and ask questions. Tarnya doing cranial decompression level 2, also completed all 3 levels. The course didn’t feel like a class room which was perfect and relaxed. I always felt like I could ask question and let out emotions if it was needed. There was a perfect level of book work/ class room information with the practical been presented clearly and was not rushed at all. There were no moves that were preformed that were pain full for the horses. The way Marisa put the course across was more like we were hanging out with family. It was all about trust and letting go of expectations and going with what feels right. There was no pressure to nail it all then and there. We all had the care and extra help in whatever area we needed it in. I can’t thank Marisa enough for the time and love she put into me and my fur babies. It was a week of my life that I will never forget for a couple of reason and this course and the way Marisa put it across has been a life changing experience for me. I’m excited for where this new open door will take me. Robyn, my gracious hostess whom completed level 2 and 3 . I found the classes to be very informative with plenty of opportunity and time to practice the moves. the course was delivered clear and precise manner. I was very satisfied with the work done. at no time was the horses stressed and participants were patient and kind to each other and all the horses. Karina completed all 3 levels. The overall course was awesome, mind blowing in fact. Marisa’s level of knowledge and ability to communicate it to others was fantastic. She is very generous in what she offers and goes that extra mile for anyone requiring more. The information was presented in a way that was easy to follow and the pace at which it was delivered to accommodate everyone was also good. Even though I didn’t take one of my own horses, I could see changes in the ones I worked on over the course. I am excited to continue this work on my own horses and submit some case studies. I thought that doing working on each other before going out to the horses was perfect. 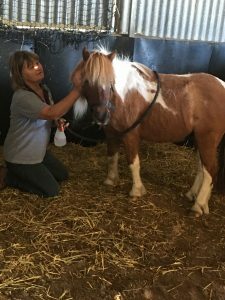 It enabled us to get an idea of what was going on for the horse and receiving feedback from everyone on what they were experiencing. I feel fantastic after my time on the table. I highly recommend this course to anyone.